The Emergo Train System Burn set consists of a victim bank with various degree of burn injuries and is developed for the purpose of running simulation exercises were the scenario results in a large number of patients with burn injuries. 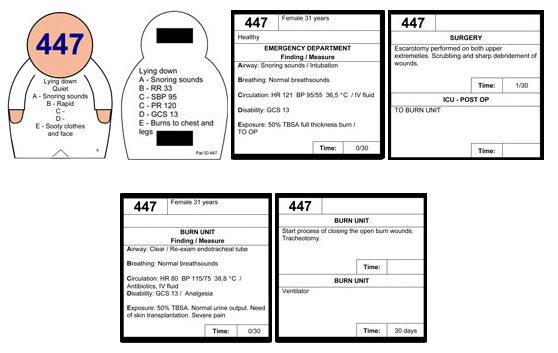 The burn set consists of 72 patients with management cards. Some of the patients are in need of specialised burn care and have an extra management card describing the interventions needed at a burn unit. The victim bank in the Burn set have been developed together with experts from national burn centres in Sweden and Western Australia.